Delta later tweeted that its teams "restored all IT systems after a technology issue" and the ground stop was lifted. Delta Air Lines experienced a computer outage that led to a nationwide ground stop on Tuesday — and which had some airline passengers complaining they were unable to access its app or get boarding passes. The airline later said the problem was fixed and the "mainline groundstop" in the U.S. was lifted. The Federal Aviation Administration said that the airline requested a ground stop due to a computer outage affecting passenger check-in and other aircraft prep issues. Delta said just before 9:30 p.m. ET that the ground stop was lifted. 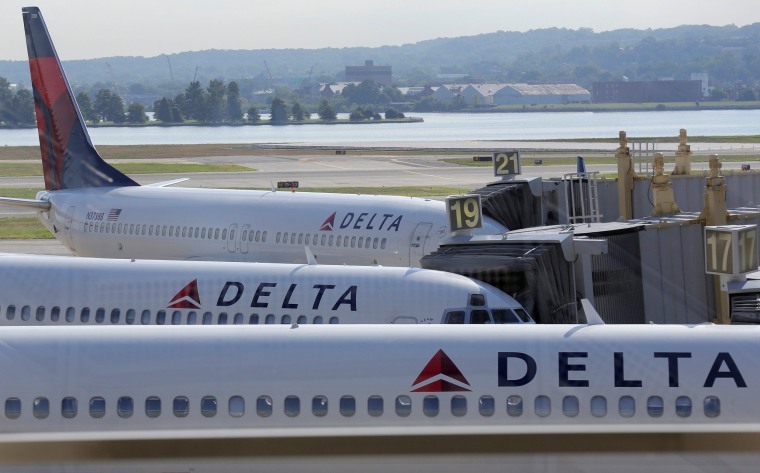 "Delta teams have restored all IT systems after a technology issue briefly affected some systems this evening," the airline said in a statement. "Delta employees are now working diligently to accommodate customers whose travel plans have been affected." It also said there were no impacts to flights in the air. The airline tweeted at around 9:13 p.m. that "We’re seeing ALL systems returning to normal operations. We apologize for any inconvenience." There were reports of problems around 2 hours prior to that message. Earlier, the airline said on Twitter that “our computer tracking system is temporarily down" and that the technical issues were system-wide. It tweeted that “international flights are still going." Many on Twitter messaged the airline and complained difficulties getting boarding passes and some said they were stranded at airports or couldn’t access their flight information. In January of 2017 Delta had a nationwide ground stop due to a “systems outage.” The issue caused at departure delays and at least 150 cancellations overnight in that outage. Delta hub airports like Atlanta, Memphis and Minneapolis-St. Paul were particularly affected. Delta’s CEO apologized for that incident and said "This type of disruption is not acceptable to the Delta family who prides itself on reliability and customer service." In December of 2017 there was a nearly 11-hour power outage at Atlanta’s Hartsfield-Jackson International Airport, where Delta is headquartered, causing hundreds of flights to be cancelled. Delta says it has annual passengers of more than 180 million and more than 15,000 daily flights, although that also includes worldwide alliance partners.